This unit arrived in a blown vinyl box complete with a selection of bits, so all that was needed to test the unit was a piece of work and air to power the hand piece. The compressor needs to deliver 1.5cfm at a constant 40psi. Upon initial examination the unit is well engineered and reasonably priced compared to similar units on the market. It claims to run at speeds from 350,0000-500,000rpm, which is pretty fast compared to your average electric rotary tool, such as a Dremel, which only runs up to around 50,000rpm. Before use the unit needs to be oiled and then run for a few seconds - it also needs oiling every 20 minutes during use. This is quite straightforward but is necessary to give the bearings long life. The bits used are a dental-type. With a good selection available they last quite a considerable time, enabling the user to pierce or add texture onto the surface of the wood. It must be made clear that the unit is not for heavy erosion of the surface and should only be used to create surface texture - not for serious stock removal. I found it both easy and comfortable to use. No tools are required to change the bits - you simply press the plunger on the end and the bit is ejected - a feature I particularly liked. The unit requires minimal pressure to do what is required but can create considerable dust and debris very quickly, so personal lung protection is essential. 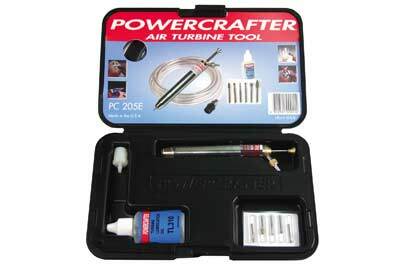 I would advise setting a small fan to one side and wearing personal dust protection when working with a high-speed air turbine such as the Powercrafter. It generated no heat and I experienced no vibration, which is a real advantage if using it for long periods. This is a well made, sensibly priced tool for those wanting to add texture and pierce their work. The tool comes in a sturdy case and fits in the hand well. Changing bits is very easy via the plunger release mechanism and it is a simple tool to use. The oiling is easy but be careful not to let any contaminate off your fingers mar your work. It does emit a high pitched whine, which can be annoying after a while, but then most tools of this type do this. 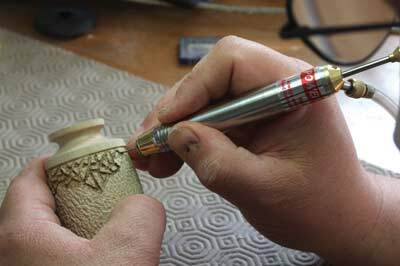 For piercing thin walled work, texturing and other such detail work it is a lovely tool to use and is in the mid price range.